Oak Barn is a most substantial five bedroom barn conversion offering flexible accommodation approaching 3,000 sq. 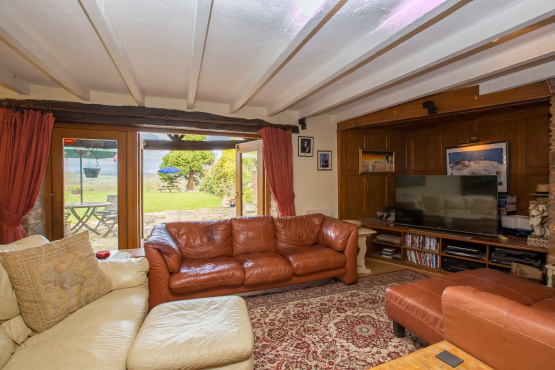 ft., full of character features, including vaulted beamed ceilings and wood panelling. On the upper floor there is currently a generous entrance hall with galleried area looking down to the living room below. This floor accommodates four double bedrooms including a stunning master bedroom with walk in dressing area and newly fitted en-suite. On the ground floor there is a further bedroom, a sizeable contemporary kitchen with eight velux windows to the vaulted ceiling, flooding the room with natural light. Two generous reception rooms conclude the ground floor accommodation. The main reception area features a brick fireplace with large oak lintel over and large double doors providing the frame for an outstanding view over the garden, toward the countryside to Haytor beyond. Externally the property benefits from extensive gardens including a large and level lawn area and gravelled driveway providing parking for numerous vehicles. Oak Barn is offered for sale with a Guide Price of £650,000. For further information please contact the Totnes branch of Marchand Petit Estate Agents on 01803 847979.